The Society of the Plastics Industry (SPI) developed a coding system to give manufacturers and recyclers a uniform way to identify the resin type of plastic containers so they can be properly recycled. There are seven resin identification codes represented by the numbers 1 through 7. The symbol consists of one of these numbers surrounded by “chasing arrows” in a triangular shape, or simply a triangle. 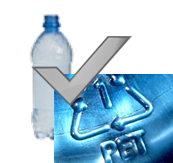 The symbol is accompanied by an abbreviation of the plastic resin type, such as “PET” or “PETE” (polyethylene terephthalate) for resin type #1. 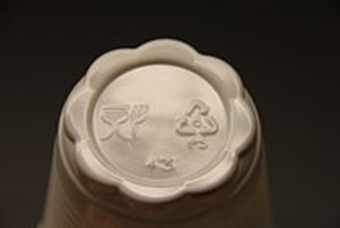 The symbol is generally molded or embossed into the base of the container. The recommended size is equal to or greater than one-half inch, depending on the size of the container (measurements are for the symbol alone, not including letters). Thirty-nine states in the United States require use of the RIC on plastic bottles and rigid plastic containers between 8 ounces and 5 gallons in size. The resin identification code is strictly an identifier of the type of plastic and doesn’t address recycled content or recyclability of the container. These incorrect uses confuse people and often lead them to put nonrecyclable packaging in their recycling bins. Why is this a problem? It’s expensive for recycling facilities to separate out these nonrecyclable materials. It can also lower the quality and value of the recycled raw materials that manufacturers use to make new products. Using a prominent RIC requires following the same guidelines as a Möbius loop when it comes to unqualified claims – that is, text or numbers must accompany the RIC to clarify the claims being made. However, that does NOT apply to inconspicuous use. Just when the RIC is very prominently displayed and used as a claim. DO place the resin identification code in an inconspicuous location at the bottom of plastic containers so it is less likely to influence buying decisions. DO use the code strictly to identify the resin type. 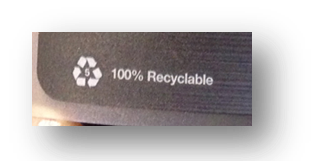 DON’T place any recycling claims or the word “recyclable” near the code. Resin identification code in inconspicuous location with no accompanying language. Resin identification code in prominent location on the package and/or accompanied by recyclability claim. In 2008, the Society of the Plastics Industry transitioned the resin identification code revision process to the standards body ASTM International. In 2010, ASTM International issued ASTM D7611 – Standard Practice for Coding Plastic Manufacturers Articles for Resin Identification, which was revised in June 2013, moving away from using the three chasing arrows and replacing them with a solid triangle. This change was intended to avoid confusion since many consumers associated the three chasing arrows with a recyclable message.